Those who’ve followed me for a bit or are readers of my blog are probably aware I’m fully in favor of free trade. I’m also in favor of President Trump’s use of tariffs as a negotiating tool. Imports, of themselves, are not “bad” and can be highly additive to economic growth. At it’s most basic level an import is no more than a transaction. It happens to occur between a buyer and seller who reside in differing countries. The transaction occurs for a reason. Consumers – companies, individuals & governments (theoretically) – look about for the best value for their money. This doesn’t necessarily mean the cheapest price. Quality can be a huge factor as well. Free trade can be beneficial for all parties. And Trade deficits are not inherently bad. A Trade Balance is simply the value of Exports minus the value of Imports. A Trade Surplus means the Value of Exports exceeds the Value of Imports. A Trade Deficit means the Value of Imports exceeds the Value of Exports. Let’s revisit a simplistic example (intentionally leaving aside currency rates). Country A exports chips and imports beer. Country B exports beer and imports chips. Countries A & B trade only with each other. The price of chips is $2 and the price of beer is $3. Country A exports 4 bags of chips and imports 3 bottles of beer. Country B exports 3 bottles of beer and imports 4 bags of chips. Country A is running a Trade Deficit of $1. Conversely, Country B is running a Trade Surplus of $1 (Price of Beer * Bottles of Beer – Price of Chips * Bags of Chips). Notably, the sum of Country A’s Trade Surplus and Country B’s Trade Deficit = $0. Assume Country A is the United States and Country B is China. China will be lending $1 to the United States in the scenario above. The U.S. receives $9 worth of beer – plus $8 dollars worth of yuan for the chips sold to China. China receives $8 worth of chips – plus $9 for the beer sold to the U.S. The U.S. can trade its $8 in yuan for $8 of the $9 dollars China is holding from their transaction. The remaining $1 in China’s possession is now a debt of the United States. China has a $1 promise of future goods or services from the United States. Assume this trade pattern is repeated – again and again. Soon China has accumulated a large number of dollars – $1 for each transaction. China will be forced to put these accumulated dollars to work by buying U.S. Treasury Bonds and/or U.S. stocks. This is what is meant by “foreign investment is the inverse of trade deficits…the bigger your deficit, the more foreign investment you get”. The country accumulating the debt is only better off if it’s using the proceeds for productive growth purposes. Transactions take place in a free and open market. Displaced workers can transition to new, similar-paying jobs over time. It’s not entirely clear that any of the three assumptions apply to the United States. On examination of the formula it appears that GDP automatically increases when Exports rise and/or Imports fall. That would be the case if all else stayed static. Of course things don’t stay static in a complex real-world economy. When trade deficits fall foreign investment also falls. Other factors will change as well. Capital flows shift. Currency rates adjust. Central Banks can – and do – distort markets. The number of variables are simply staggering. But all of this ignores the broader issue at play. PRESIDENT TRUMP: I would have a higher stock market right now, it’s already up almost 40%, as you know, since the election. It could be 80% if I didn’t want to do this. But ultimately, what I’m doing is making it so it’s right. Consider what’s being said. President Trump wants our trade partners to prosper with us – not at the expense of us. President Trump clearly understands that imposition of tariffs is a risk to market stability and strength. He notes that financial markets would be higher if he wasn’t going through this process of re-shaping our trade agreements. It’s critics like Goldberg, focusing on short-term pain at the expense of long-term gain, which got us to this point – 42 years of unbroken trade deficits. Goldberg’s right about one thing. Tariffs for the sake of tariffs are bad economic policy. But so are misguided and unfair trade practices. So I’m perfectly clear, I’ll say it again: I’m not in favor of tariffs as an economic policy. Tariffs reduce economic activity for all parties. They are a hindrance to free trade. But in the appropriate circumstances – in the right hands – they can be an effective economic club. We’re already on the losing side of trade policy. It’s often overlooked that these trade agreements and practices have been in place and accepted for decades. I don’t know about you but I prefer to push back against losing trade policies rather than continue to meekly accept them. Ultimately, what’s going to happen is they’ll end up not charging a tax and we won’t have a tax. And that becomes free trade. This is about negotiation. Using tariffs as a negotiating tool in the short-term. Imports & trade balances of themselves are not the problem. Heavy regulations, tax imbalances & Multi-lateral Trade Agreements are the problem. President Trump knows this. Consider the careful steps he’s taken. President Trump started with regulation. Hundreds of regulations were killed during his first year in office. If you tell me we’re going to experience lower taxes and reduced regulation, I’ll tell you the economy will improve, GDP will rise, the jobless rate will fall and the stock market will move up. Now President Trump is focused on trade. NAFTA is on the chopping block and furious negotiations regarding unfair trade practices are going on behind the scenes. Trade deficits aren’t inherently bad – as long as they result from an even playing field. But when they result from uneven regulation, differing tax treatment and bad multi-party trade agreements that create manufacturing imbalances – problems arise. Multi-lateral trade agreements like NAFTA, by their very definition, are not free trade. They are Multi-Party Trade Agreements. Admittedly, a pure free trade agreement is politically hard to come by. Issues of corporate tax rates, governmental regulations, etc. intrude their way into practical application. If we must enter into trade agreements, they should be done on a bi-lateral negotiated basis. Some misguidedly say we don’t need to worry about trade agreements. We don’t need to worry about manufacturing jobs. What’s done is done. Some of those jobs of the past are just not going to come back. When somebody [Trump] says…that he’s going to bring all these jobs back. Well how exactly are you going to do that? What are you going to do? There’s no answer to it. CNBC: Over the past year through July, U.S. manufacturing added 327,000 jobs, the most of any 12-month period since April 1995. It’s not just jobs that are growing. 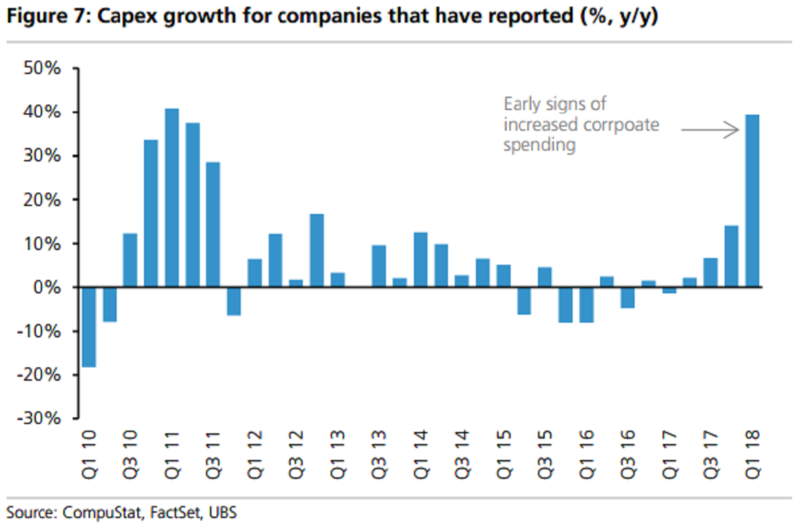 Capital spending increased by 39% in Q1 ’18 – the fastest growth in seven years. Expect another good number for Q2 ’18 after full reporting has completed. Business only make discretionary capital outlays with the expectation of achieving a superior return on their investment. They are literally betting on economic improvement & GDP growth. Now, contrast Goldberg’s doom & gloom over tariffs with actual economic numbers and performance of the financial markets. Markets are forward looking. They price in all available information. I’m all but certain the markets expect President Trump’s tariff’s will be short-lived. If we listened to critics like Goldberg, a long-standing trade problem would continue to be perpetually ignored. But then, If we’d listened to Goldberg we’d have Hillary Clinton as President.